Watermelon “popsicles!” Propping quarter slices up on popsicle sticks are not only a fun way to eat but also keeps the kiddies’ hands clean – well, cleaner than usual at least. Use cookie cutters to slice the watermelon flesh into fun shapes. Puree overripe watermelon into pulp and mix it up with lemonade for a refreshing watermelon smoothie. Alternatively pour the mixture into popsicle moulds and freeze it for a refreshing snack. Make a watermelon pizza by simply topping a flat watermelon slice with an assortment of other fruits, yogurt and cream, and cutting it into “pizza slices”. 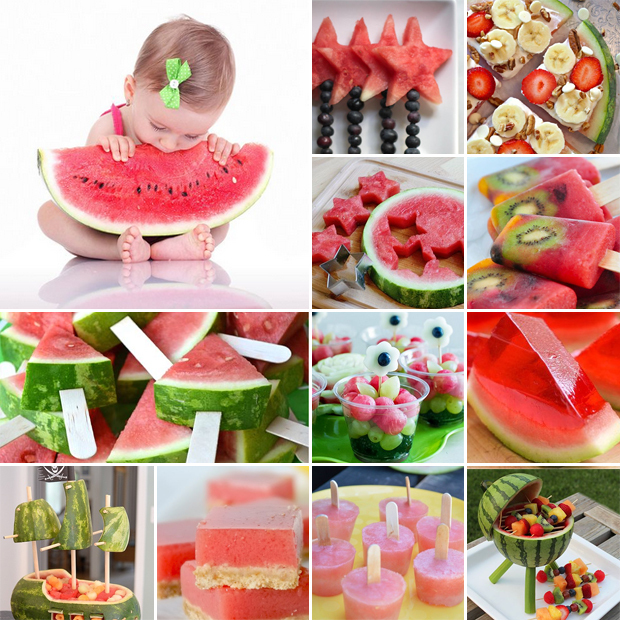 Slice the watermelon into cubes and pop it into lemonade as fruity “ice cubes”. Make a watermelon ‘basket’! Cut the watermelon in half and scoop out the flesh with an ice cream scoop. Place the melon balls back in the “bowl” along with other fruits. Instead of filling the “basket” with fruit, pour jelly into it and let it set. Then cut into slices and serve! Experiment with watermelon in a slightly more savoury setting, pairing it with feta in refreshing salads.